A new study released by European energy company Vattenfall concludes that curbing climate change through a sustainable reduction of greenhouse gas emissions is technically and financially feasible if existing technical solutions are applied consistently—and globally. Vattenfall’s Global Climate Impact Abatement Map shows that the cost of stabilizing the concentration of greenhouse gases at 450 ppm by 2030 in an attempt to limit global average temperature increase to 2° C is equivalent to approximately 0.6% of the total gross world product—on condition that all the identified potential is exploited. The study maps total global reduction potential, analyzed by six major commercial sectors—power, transport, industry, forestry, buildings, and agriculture—and by six major world regions—Europe OECD, North America, China, other industrial countries, transition economies, and the rest of the world. 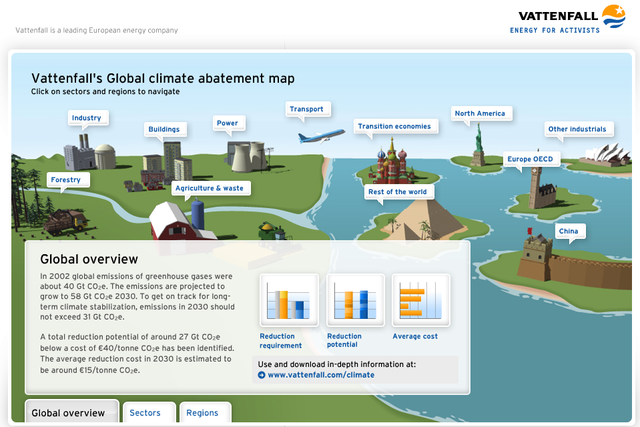 Vattenfall presented its Global Climate Impact Abatement Map at a conference in Berlin on Thursday. What we are presenting in Berlin here today is an outline of a first global map for measures to curb the climate change. Now we must jointly embark on a voyage of discovery on which we gather new knowledge and new information that we can use to further refine this map. Already today, however, we can see that the active protection of the climate is not a utopia – it is possible with the technology we now have at our disposal, and this technology can also be improved. We must immediately set up a global policy framework to enable us to exploit the potential described here. One absolutely vital precondition is that we put a binding global price on the emission of greenhouse gases. The empirical data gathered also shows that there are considerable hidden possibilities in the industrialized countries, and particularly in the energy-efficiency field, to protect the climate at a negative cost—that is, by applying measures that finance themselves in that they reduce energy costs. On a global scale, around 7 billion tonnes of greenhouse gas emissions could be saved annually, which corresponds to about seven times the total annual emissions in Germany. Vattenfall estimates that the average cost of avoiding emissions would be €15 per ton CO2 equivalent [~$19.50/ton USD]. The data also reveals that the potential for protecting the climate is relatively evenly distributed between the investigated sectors and geographical regions. Up to 45% of the potential was found in the industrial and energy sectors, while the developing and threshold countries (excluding China) account for more than 40% of the climate-protection potential. According to the survey, about 40% of the measures in the industrialized countries can finance themselves. Last week, a delegation of business leaders including Josefsson and Fulvio Conti, the CEO of Enel, another European power company, presented the global 3C (Combating Climate Change) initiative to President of the European Commission José Manuel Barroso. Josefsson suggested the outline for the 3C initiative during the 14th Session of the UN Commission on Sustainable Development in New York in May 2006. More than 15 companies worldwide [including some of the world's largest] have endorsed this initiative, demanding an integration of climate issues into the world of markets and trade: ABB; Alstom; Bayer; Deutsche Post World Net; Duke Energy; Endesa; Enel; EnBW; E.ON; Eskom; General Electric; Norske Skog; NRG Energy; PG&E Corporation; Siemens; Suez; Wallenius Lines; Vattenfall. This is a very interesting study. I haven't had the chance to delve too deeply into its assumptions, but they look reasonable. Their conclusions are similar, although a bit more optimistic, than the Stern Review, another report on the economics of combating climate change released in October by former Chief Economist of the World Bank, Sir Nicholas Stern. That report, commissioned by UK Prime Minister Tony Blair, concluded that the costs of stabilizing atmospheric CO2 levels at 450 ppm by 2050 would be approximately 1% of global GDP (note that the Stern Review assumes stabalization in 2050, 20 years after the 2030 stabilization date assumed in the Vattenfall study). The flashy interactive Flash map they put together to present their results is excellent! This is a great example of a very interesting and informative way to present a dense amount of imformation in a user-friendly and accesible way. Having worked myself with Flash, I'm quite impressed. I'd highly recommend poking around Vattenfall's interactive map for a few minutes. It seems to me that at this point in time, we've finally moved past trying to convince people that climate change is occuring and that it will have real consequences, for the most part anyway. The major stumbling block in the way to action addressing climate change now seems to be questions of cost. Many policymakers, particularly in the United States, are operating under what is largely a false assumption that taking action on climate change will come with an exorbitant price tag and will cripple the economy. This false dichotomy - combatting climate change or having a healthy economy - seems to be quite pervasive in the minds of policymakers and legislators in Washington DC. It is my hope that we can break down this barrier to action soon, and studies like this help to dispell the myth that combatting climate change and having a healthy economy are mutually exclusive. There are clearly many steps that we can take to rein in greenhouse gas emissions that not only pay for themselves, but can also save us money (by saving energy or increasing the efficiency of resource use), leading to a stronger economy. These are the steps that we are simply stupid not to take, and are the ones that should be taken immediately to address climate change. The savings from these measures can then help offset the marginally higher costs of other measures that will together get us to the emissions reductions targets that will stabilize atmospheric greenhouse gas levels at a reasonable cost. I say reasonable, because there is a factor that many simply don't consider at all when talking about the supposed 'costs' of addressing climate change: the costs of inaction. As the Stern Review made clear, the longer-term costs of only a limit range of effects of unabated climate change would be at least 5% of global GDP. Considering more recent scientific evidence (for example, the risk that additional greenhouse gases will be released naturally as Arctic permafrost melts), the economic effects on human life and the environment, and approaches to modeling that ensure the impacts that affect poor people are weighted appropriately, the Review estimates that the dangers could be equivalent to 20% of global GDP or more. Thus, we shouldn't even be talking about the costs of addressing climate change, but rather the savings. Spending 0.6%, or even 1% of global GDP to combat climate change should not be viewed as a cost, but rather a savings of at least 4% of global GDP, and perhaps as much as a staggering 19% of global GDP. The question is not "can we afford to address climate change", but rather, "can we afford not to address climate change?" 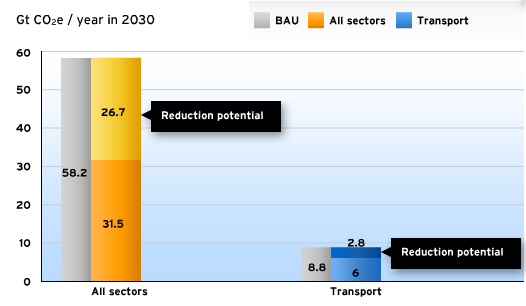 Check out what they say about North America's potential: Current emissions: 6.5 Gt, BAU emissions: 8.8 gt (2030). Reduction potential: 4.4 Gt. Average abeatement cost NEGATIVE: It won't cost us anything, and may actually be a profitable investment. Yeah, I haven't looked too closely at their assumptions, so I'm not sure how they arrived at that number, but I'm not too surprised. The gains we could make with efficiency measures alone (in electricity, industry and transport sectors) are pretty staggering and would come with a net negative cost - i.e. they'd save billions of dollars. The savings from those efficiency measures could offset the moderate costs of other carbon reduction measures - like new low-carbon technologies, renewables, etc. - making the whole prospect free, if not profitable. And, as I mentioned at the end of the post, the question is not what would it cost to address climate change. The question is what would it cost to address climate change and how does that compare to the cost of doing nothing. If the Stern Review is even remotely close to accurate, the cost of inaction clearly far outweighs the cost of dealing with climate change. You nailed it Tom. It's all about opportunity costs and the true cost, not just the price, of our energy sources. I work for a renewable energy advocacy non-profit here in Oregon, the Renewable Northwest Project, and we are also working, along with our close allies the Citizens Utility Board, Fair and Clean Energy Coalition and Oregon State Public Interest Research Group to pressure the Oregon PUC to include accurate carbon costs in the Independent Resource Planning process that regulated utlities go through to determine their future energy needs and resource acquisitions. We're making progress on that front, it seems. At least in Oregon (we work on issues in Oregon, Washington, Idaho and Montana, and the other state commissions lag a bit behind OR). We were also involved in passing the CO renewable energy standard, although that was before my time with RNP. We often work closely with allies in CO, including Western Resource Advocates. The success of the ballot initiative in CO encouraged us to move forward with a clean energy standard initiative in WA this past November, which passed, and we're currently working on passing a renewable energy standard in Oregon's legislature this year. Keep up the good work with CO-force! It sure seems like we're finally moving things forward these days.